The Outer Space Men line by Four Horsemen Design continues with wave 5 and their first-ever Deluxe figure! The new waves always kick off each year at San Diego Comic Con with the Alpha Phase, which are fully translucent versions of the figures that will later be released fully painted. Join me for a look at these Alpha Phase versions of Wave 5 Orbitron and Gemini, and the first Deluxe figure Cyclops! These look like a lot of fun. 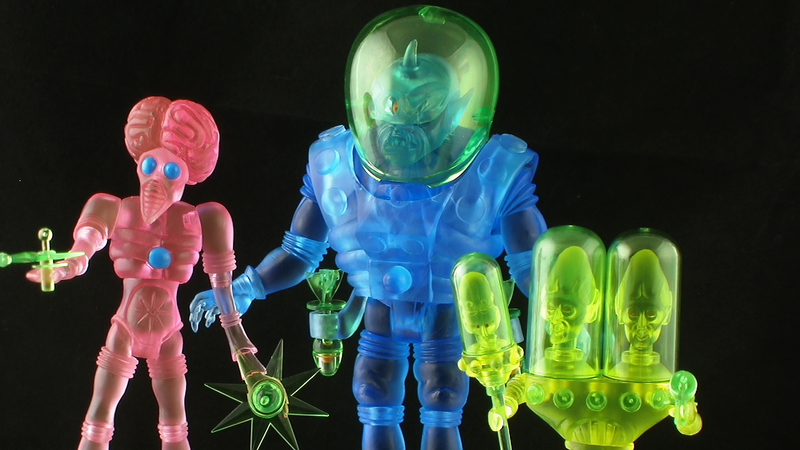 I’m not a spaceman type of collector, but I would have enjoyed these when I was a kid. When does the new Gothitropolis figures come out? Vampire Queen, the Raven and what not. Release dates haven't been announced for those yet, but I'm excited for them as well! Love my OSM collection, not missing a figure and cant wait for more! Thanks! This is one of my absolute favorite toy lines right now! These version are awesome ! Your pictures are so good, we saw beautilful colors in this video. It was really the 60’s (1968) that the originals debuted, but we’ll forgive you. @Dan: Yeah, he was inspired by the aliens from This Island Earth. Another fun fact: According to Mel Birnkrant, the current symbol on Cyclops’ chest is a Glyos Pheyden face. Well, loosely translated as one.